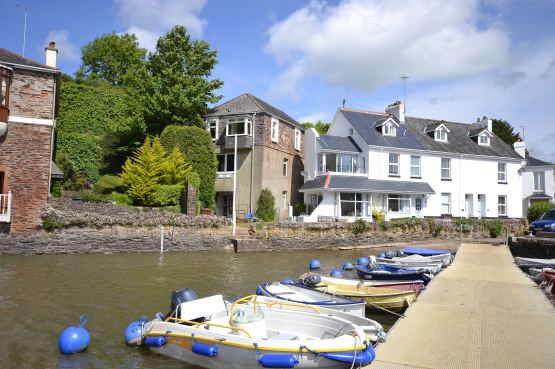 Waters Edge, Stoke Gabriel offers a superb opportunity to acquire a desirable waterside home which has been completely refurbished to provide accommodation over three floors, including three bedrooms, beautiful open plan living space and uninterrupted views of the River Dart. Stoke Gabriel is a picturesque village on the banks of the River Dart and located in an area of outstanding natural beauty. A short walk from Waters Edge you find the local village shop, two pubs, a café and restaurant. Stoke Gabriel benefits from the availability of booming social and sporting clubs, including an extremely popular and active boating association. When Waters Edge is not being enjoyed for fantastic family holidays, the property has been successfully holiday let by a local company. This is a luxurious property in the most idyllic location. Waters Edge is offered to the market with a guide price of £650,000. For further information please contact Marchand Petit’s Totnes office on 01803 847979.